sCO2-FLEX is an EU funded project that brings together key academic and industrial stakeholders to demonstrate how supercritical CO2 could contribute to Europe’s climate change and energy transition goals by making fossil-fuelled power production more capable of supporting a smarter and more flexible energy market. Fossil fuelled power plants are increasingly expected to provide fluctuating back-up power, to foster the integration of intermittent renewables energy and provide stability to the electrical grid. Therefore, there is a need to develop innovative and cost-effective ways of enabling existing and future fossil fuelled power plants to be flexible enough to deal with load fluctuations and also achieve reduced emissions. In this context, the sCO2-Flex project, funded for three years with a €5 million grant from the EU Horizon 2020 programme, and led by French utility EDF, brings together an interdisciplinary group of partners including researchers, technology providers and industry experts covering the whole value chain (see Figure 1) with the aim of adapting fossil fuelled power plants to future energy system requirements. 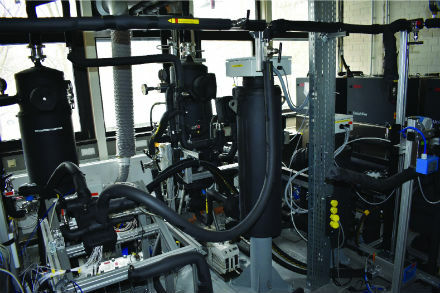 To do this it is developing and validating a scalable/modular design for a 25 MWe Brayton cycle plant using supercritical CO2, a working fluid that will enable an increase in the operational flexibility (faster load changes, start-ups and shut-downs) and efficiency of fossil fuelled power plants, with much more compact turbomachinery. Supercritical CO2 cycles are not a completely new technology (Figure 2). Already by the end of the 1960s several researchers and engineers from different countries were studying the potential advantages of such cycles. In 1968, Gianfranco Angelino proposed the forerunner of the modern recompression cycle architecture, the most interesting and studied cycle configuration due to its high efficiency and low complexity. Around the same time Ernest Feher investigated the concept and came to conclusions similar to those of Angelino: supercritical CO2 cycles enable higher efficiencies to be achieved than those of conventional power plants, even at moderate turbine inlet temperatures. During the early 1970s these investigations shifted from purely thermodynamic calculations to more detailed design studies, especially coupled to nuclear power and shipboard applications. Despite all this work, the sCO2 cycle has not been deployed in practice, mainly due to poor turbomachinery experience and lack of suitable compact heat exchangers. In recent years, starting from Vaclav Dostal’s work at MIT on the adoption of sCO2 cycles with high temperature gas cooled nuclear reactors, interest in supercritical carbon dioxide power cycles enjoyed a revival. The research and development effort on sCO2 cycles has focused predominantly on three main power generation types: concentrating solar power (CSP); “Generation IV” nuclear reactors; and fossil fuelled power plants. The US National Renewable Energy Laboratory and its partners, under the 2012 SunShot CSP programme, are developing a turbine design able to demonstrate the feasibility and economic viability of a multi-MW power cycle using sCO2 as the working fluid. With regards to fossil fuel applications, a 50 MWt demonstration plant for electricity generation from natural gas using an oxyfuel direct fired sCO2 cycle, the Allam cycle, has been built by NET Power and Toshiba and is undergoing commissioning at a site in La Porte, Texas. design of an effective instrumentation and control system, with increased adaptability to load variations to ensure that the nominal and part-load performance of the sCO2 cycle is achieved with quick response. Moreover, the consortium aims to demonstrate that the deployment of such a technology will enhance cycle efficiency and reduce environmental impacts in a cost-effective way. design of a 25 MWe facility employing the sCO2 cycle ready for implementation in a demonstration project, from 2020 onwards. achieving a levelised cost of electricity (LCOE) for coal and lignite fuelled sCO2 Brayton cycle plants that is 6 to 16% lower than the estimated LCOE of future supercritical coal plants with CCS. reducing the quantity of metal alloys needed for turbomachinery and the overall environmental footprint of the plant by at least 25% by decreasing the size of power block components/ increasing power density. The sCO2-Flex project aims at enabling coal and lignite plants to run at very low minimal load (20%) with a high degree of flexibility while reaching a nominal efficiency of 48%. The table below compares sCO2-Flex performance in terms of flexibility and efficiency with ‘conventional’ coal, lignite and combined cycle. sCO2-Flex has the potential to become a game-changing project for coal/lignite power plant technology, by putting at the disposal of suppliers and end-users a 25 MWe sCO2 Brayton cycle plant design with high flexibility, high efficiency and minimised environmental impact and costs. The project, by bringing the sCO2 cycle to TRL6, will pave the way to future demonstration projects and to a potential commercialisation of the technology. For CO2, the critical point pressure and temperature are respectively 73.8 bar and 31°C. Under these supercritical conditions carbon dioxide has characteristics of a gas (eg expanding to fill its container) and a density akin to a liquid. The thermodynamic properties of supercritical carbon dioxide allow the use of compact turbomachinery designs (with smaller diameters and fewer stages than with steam or other gases – eg, helium – machines) enabling higher flexibility and reduced materials requirements (resulting in lower costs).